Time to rock-'n'-roll. We showered in the toy-shower, wolfed down the breakfast buffet. Having sorted and repacked everything the night before, it was an easy matter to throw our luggage in the car, hit A1 south, turn into the car-return area of National/Citer/Alamo in Aerogare 2, drop the keys, find American's check-in desk, get our passes, dump the large luggage, go through security, and then....while away hours waiting for departure. 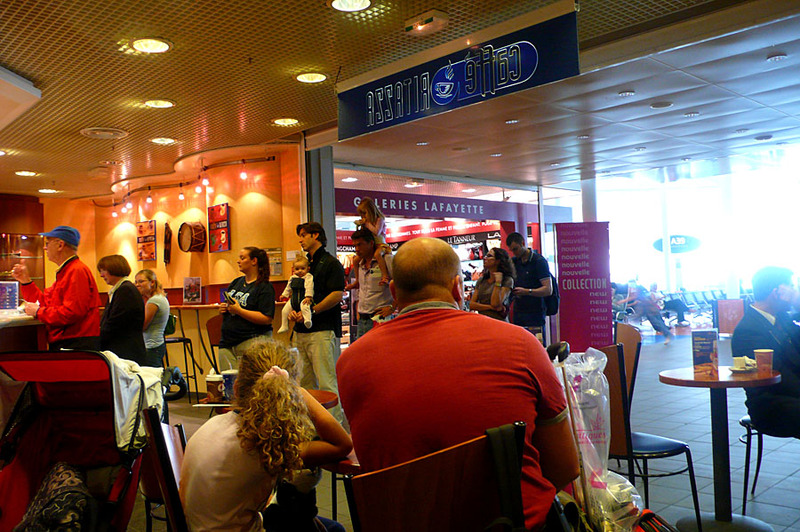 We had "breakfast" wine and a sandwich towards noon (in a small cafe inside the airport security area--see below). The plane, full this time, left almost on time, and we had an easy--if long--seven-hour flight back to Boston, to the Concord bus, to Elite Taxi, to our back door. Done.